This past Friday CIADC and Embarc Chicago joined forces to bring local students from Sullivan High School into the shops for a day of immersive education, access and community. The kids jumped right in and knocked out projects from three of our departments: Metalworking & Forging, Woodworking, and Casting & Molding. In each department, the student’s eyes were wide but focused as they worked. 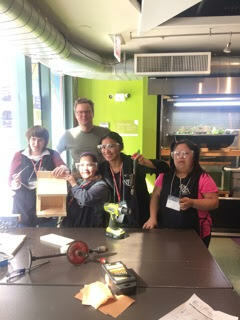 In the Metal Shop, Olivia taught the students how to forge, hammer and twist a piece of bar stock into a handy key fob. 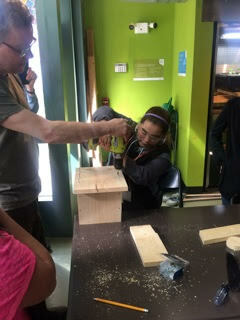 Up in the Woodshop, Erik guided the students on the bandsaw to produce a small box. And in Casting & Molding, Micki and Julia had the students independently design their own scratch molds and then poured 1,200 degree hot aluminum get poured into them to create a cast of their design. Embarc’s goal is to drive student success with long-term social and cultural exposure. Through the transformative power of these journeys, Embarc awaken students to the possibilities of their potential by dissolving the borders of the city and in their minds. Inspired by Embarc’s important work, CIADC is excited to announce the gift of 30 full-tuition scholarships to local teens. CIADC is working with both Sullivan High School and the Chicago Math & Science Academy to identify scholarship recipients. The Chicago Industrial Arts & Design Center is excited to announce the gift of 30 full-tuition scholarships to local teens (a $6,000 value)! CIADC is working with both Sullivan High School and the Chicago Math & Science Academy to identify scholarship recipients. "Learning to create sculpture, furniture, product, or ornament in an industrial shop environment using power tools with permanent materials and technology not only teaches design, vocational skill, and technique, but also instills confidence, teaches responsibility, develops problem-solving and organization skill sets, fosters creativity, and empowers! These traits are transferable no matter the career path chosen." CIADC is proud to give this opportunity to local Rogers Park teens this May! 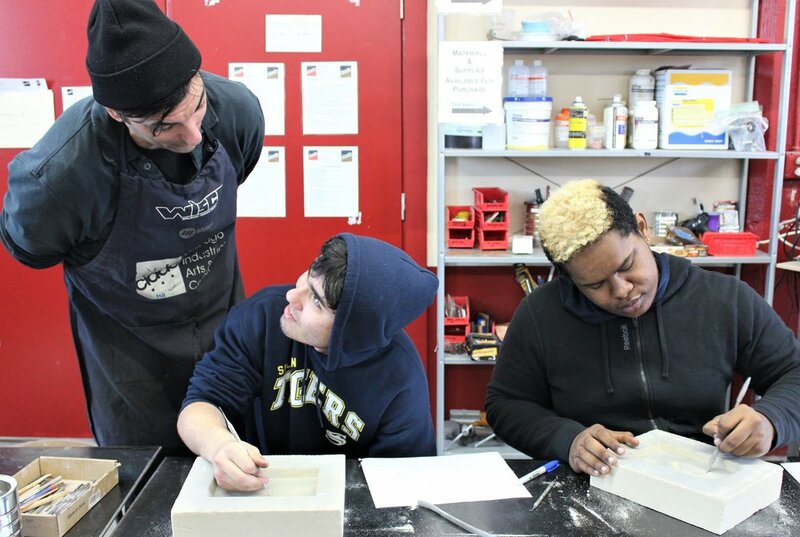 Last week, Chicago Industrial Arts & Design Center was happy to welcome a group of 11th graders from Sullivan High School with Embarc Chicago for an experiential learning journey that encompassed our Casting, Metal, and Woodworking departments. Embarc is a three-year program that provides community-driven, experienced-based learning opportunities to low-income High School students to inspire and prepare them for college and career success. CIADC instructors Micki LeMieux (Casting & Molding), Erik Newman (Woodworking), and Matthew Runfola (Metalworking) designed a 3-hour program, rotating students through each shop learning more about design, material, and process while creating components to assemble into a personal sculpture. In the casting department, students created plaster casts of their fingers, using alginate molds. In woodworking, they cut and sanded clear pine wooden base, using bandsaw and scroll saw. And in the metalshop, students cut and folded a steel platform, using power shear, throatless shear, and magnetic sheet metal brake. CIADC hands-on, experiential learning: learning shop skills directly applicable to creating objects, but also learning transferrable skill sets such as creativity, problem-solving, critical thinking, and empowerment. Our thanks to Ellen Muench of Embarc Chicago for choosing CIADC as a journey destination! 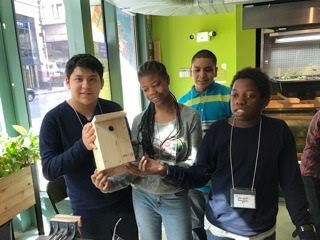 Teen programming (12-15): 5-week Summer classes, 1-week Summer Camps. Ages 16+ enrolled in adult programming with consent.